Thanks in no small part to Susan Cain's bestseller Quiet: The Power of Introverts in a World That Can't Stop Talking, people have never been more aware of extroverted and introverted personality types -- that is, people who gain energy from social interaction and people who gain energy from alone time. Cain argues that contemporary Western culture, fueled by corporate structures and values, has overemphasized extroverted traits and norms: quick decision-making, outspokenness, and social confidence among others. Given education's close connection with the corporate world, schools are no exception. Often it's the students who eagerly raise their hands, dominate small groups, and think on their feet that draw our attention and praise, while those who are more reserved and thoughtful are encouraged to participate more. But participation can be tough for introverts as activities trend toward design thinking, play, and collaboration -- all influenced by corporate groupthink, which unfairly favors and nurtures extroverted go-getters. Extroverts and introverts depend on each other to do great things. Of course, school isn't all a dream for extroverts, either. Take the traditional essay assignment, for instance, where students are left on their own to focus their thoughts into a single long-form assessment; or, the all-too-common rows of individual desks governed by no-talking policies that isolate kids from each other. These are both carryovers from a time when the pendulum of cultural favor swung mightily toward introversion. As Cain herself argues, neither personality is better than the other, and each of us embodies a bit of both and can benefit from extending ourselves a bit out of our comfort zones. Most important, extroverts and introverts depend on each other to do great things. So, what can teachers and schools do to foster a more personality-inclusive environment? It's easier said than done, but providing students with different options for how to learn and how to demonstrate that learning allows them to gravitate toward what inspires them so they can do their best work. Some tools like 3D Game Lab make this curricular and assessment design easier, allowing teachers to map out possibilities and students to design their own paths. Participation is often conflated with thinking out loud, and that's something at which extroverts excel but with which introverts struggle. Participation can and should mean so much more: asking a thoughtful question, helping others, volunteering, coming to office hours or staying after class, posting in an online forum, doing revisions of work, and beyond. Reconfiguring workspaces for different personalities and tasks is all the rage among corporations and startups. But what's a teacher to do? Turning rows of desks into collaborative pods is a tried-and-true technique, but consider balancing social spaces with quiet zones where students can zero in on a task. But don't stop there; think beyond the classroom to other nearby spaces. Make use of common areas, labs, and the outdoors to change things up and spur creativity. Giving students a digital space where they can question, comment, and discuss during (and after) classroom activities can yield incredible results, and provide a more comfortable space for quiet and/or less confident students to speak up. TodaysMeet is a great option for backchanneling, and can work well while watching videos or films in class. 5. Create flow between social and reflective activities. We know that great work comes from collaborations between introverts and extroverts. To facilitate this in class, follow up generative social activity with more thoughtful solo or small-group reflection, distillation, and synthesis. By moving in and out of their comfort zones, students get acclimated to different styles of learning and reap the rewards from each. Photo: "who's who" by jessica polanco. Used under Creative Commons CC BY-NC-SA 2.0 License. 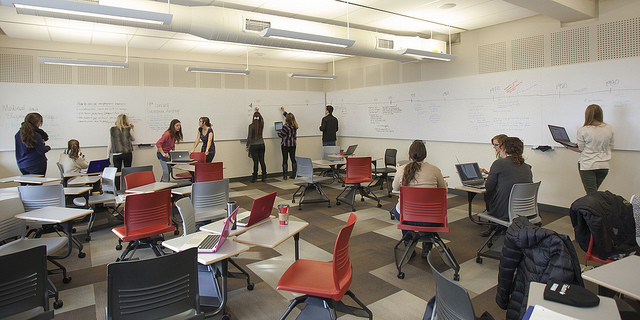 Photo: "Ellis Hall Active Learning Classroom" by Queen's University. Used under Creative Commons CC BY-NC-ND 2.0 License.